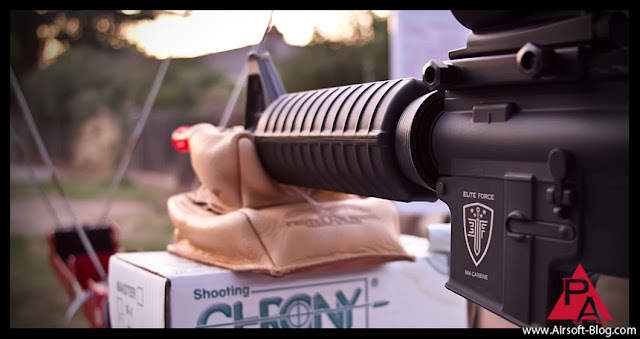 Here's a little review of the Elite Force M4A1 Carbine Competition Series AEG. Technically, I'd consider it more of a performance test. After I got the right BBs into the equation, this thing really started to cooperate. I started out using .25g BBs, but they were all over the place, so I switched to a .30g just to see what the gun would do. Low and behold, immediate improvement in flight path. I could now zero in my optic and begin the test. I realize there are a few detail-oriented issues with the video, but as usual, I prefer to make things overly complex, so some things had to be overlooked. I'll do better next time. Be sure to like our new Pyramyd Airsoft Facebook page and subscribe to our YouTube Channel as well for more Airsoft reviews, photos, comments, conversations, hyperboles, hypotheses and more.